Defence Minister Manohar Parrikar visited the family members in the village on Thursday and paid his last respects to the martyr. Family members of Colonel Santosh Mahadik, who was killed in Kashmir encounter, paying him last rites. Famous as a village of soldiers, Pogarwadi Thursday bid a tearful adieu to its son, Colonel Santosh Mahadik (37), who was martyred during a fierce gunbattle with militants in north Kashmir’s Kupwara district. 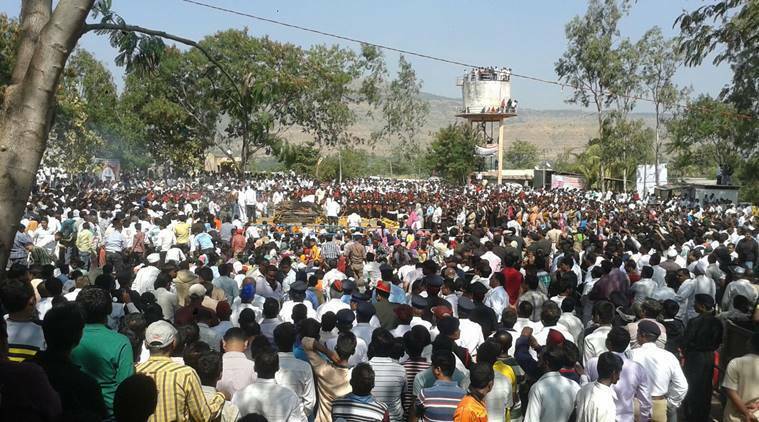 Mourners flocked to the tiny village in Maharashtra’s Satara district from different parts of the state, with serving and retired officers attending the funeral. Colonel Mahadik is the second martyr Pogarwadi village has given to the country. Chants of “Bharat Mata Ki Jai…Santosh Mahadik Amar Rahe” filled the air as the officer was laid to rest with a 21-gun salute and full military honours at the ZP school ground in Pogarwadi. Every inch of the primary school premises was filled with people wanting to pay their last respects to the slain officer. The funeral pyre was lit by Col Mahadik’s five-year-old son, Swaraj. The officer, who originally belonged to the elite 21 Para unit of the Special Forces, was awarded Sena Medal (Gallantry) for his exceptional service and leadership as a young officer while fighting the terrorists in Lolab Valley in Kupwara in 2003. On Tuesday, he took a bullet in his chest while commanding the 41 Rashtriya Rifles, during an encounter with terrorists in Manigah forest area of Kupwara. Defence Minister Manohar Parrikar visited the family in the village on Thursday and assured them of government support in their hour of grief. Talking about her children, Kartikee and Swaraj, Col Mahadik’s wife Swati told the minister that both would join the armed forces. Born on January 15, 1977, Col Mahadik was commissioned into the Army in 1998. The son of a milkman, Col Mahadik studied at the Satara Sainik School. “He was always composed. But after spending some time with him, one would realise there was a soldier in him. We knew his approach towards terrorism and insurgency had a human touch,” said his batch-mate from Sainik School. As per the local tradition, no food was cooked in the village from Wednesday. A villager said that as a mark of respect, food will only be cooked in the village after performing the last rites of the martyr. The officer’s mortal remains were received in the village on Thursday.